Pixel Prose Challenge:That’s the Spirit! The once-popular Coningshall Ghost Walk was slowly dying a death. It felt like the whole village was slipping away with it. But what was to be done? Every Saturday night for a year, eccentric Psychic Researcher Kanye Bell-Eaves, had lead an ever-growing band of followers around the village, ending at the churchyard. 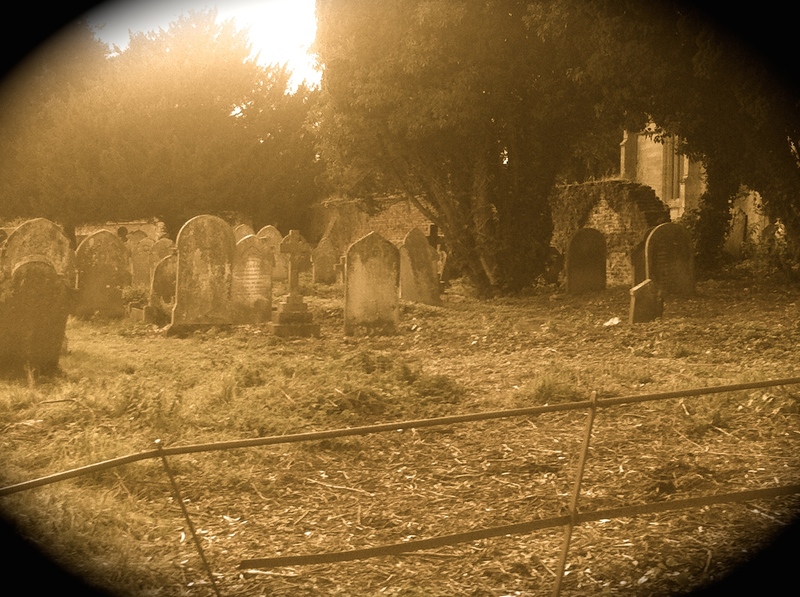 His well-crafted spooky tales were no match for the main attraction – strange noises and ghostly apparitions from the graveyard, as the church clock chimed the Midnight hour. Every weekend, the local guest houses were full to overflowing, and the two village shops were doing very nicely, thank you very much. One or two visitors had even moved into the area. But then it all started to go wrong. Without warning, the noises and apparitions stopped. Kanye worked on his theatrical presentation, but as the numbers dwindled, everyone could see that his heart just wasn’t in it anymore. A Ghost Walk without ghosts? Who needs it? A few more weeks like this and no one would be attending. He’d be finished! Local Parish Councillor and owner of the Electrical Store, Brian ‘Buzz’ Oldring, was baffled. After all, he was the one who had seen potential for the village in the Ghost Walk. And he supplied the electrical equipment that should be producing the ghostly effects. But nothing seemed to work anymore. He tested the batteries, and even replaced the whole kit. It all worked fine, until he put it in the graveyard. Buzz hadn’t slept well for some time. He’d just heard the church clock strike midnight, when his bedroom lights started flashing on and off. “Must be that new dimmer switch I fitted!” said Buzz out loud. More to reassure himself than anything. Then the lights went off and a ghostly figure hovered at his upstairs window! The figure gestured him over! Trembling, Buzz turned on his iPhone Candle app and went to investigate. Well, if it wasn’t the recently deceased local lawyer, Peter Kipper! “What sort of changes?” Buzz’s iCandle had gone out, but for some reason, he was feeling a little calmer now. And so it was, that the Ghost Walks became more popular than ever. If anything, the spooky effects seemed even more real. And the Coningshall churchyard became the pride of a prosperous village. Kanye thought ten percent seemed a fair price to pay. Story and photo are prompted by the Pixel Prose Challenge, hosted by Amanda Lakey at www.UniqueArtChic.com. To view the other posts in this challenge, click the blue frog! Like your processing of the image–works well. Thanks Sally, I used iPhoto to age it. The churchyard is in Tattershall, Lincolnshire, UK. Thanks, Amanda. I thought a lawyer would be the best person to get a good deal! Fabulous – both your writing and your photo!